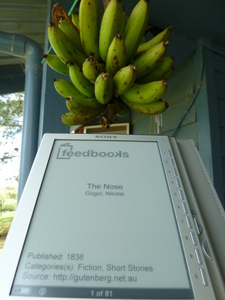 Context: We got the first of what looks to be many bunches of bananas off our banana trees while I was reading this. Brilliant. What an idea! Someone’s nose is found in some bread. A man wakes up to find his nose gone and begins a desperate search. He discovers it living a life of its own, a life far more privileged in status than it’s owner. Then it returns but there’s a twist. I loved Gogol’s short story because it contrasts so strongly with every other piece of Russian lit. that I’ve read… and I’ve read a ton. Usually, they’re painstakingly detailed (Tolstoy), deeply psychological (Dostoevsky), heavily political (Solzhenitsyn) or deeply emotional (Goncharov, Pushkin, Turgenev, Lermontov, etc. aka everything else). But this is satire to rival Swift or Cervantes… from the pen of a Russian! Wonderful. Analyses of the short story that I’ve read online tend towards searching the text for underlying psychological motives, for a political edge, for something, well, Russian about it. But I think Gogol just wanted to send a message to the literary community and say, “Life isn’t all misery and deeply felt meaning, you know!” And I think he said it very well. The story is bonkers and total fun. There isn’t a single character in it who isn’t farcical, and it doesn’t really have a point (no pun intended). And you, yes you, with that twitch in your right index finger. Step away from the mouse. I know you are dying to comment and tell me what the point is about The Nose. Gogol wrote this for you, to show you that you can just read a story to enjoy it for its own sake without worrying about what it means. If you’ve missed that, go and read it again… go on. On 25 March an unusually strange event occurred in St. Petersburg. For no matter what folk say to the contrary, such affairs do happen in this world – rarely of course, yet none the less really. If you haven’t read his short story “The Overcoat” I’d highly recommend it. I liked it even more than this one.